Buying the best string trimmer is one thing, using it properly is another thing. A high-quality weed eater will deliver the best performance and professional results only if you can use as instructed by the manufacturer. 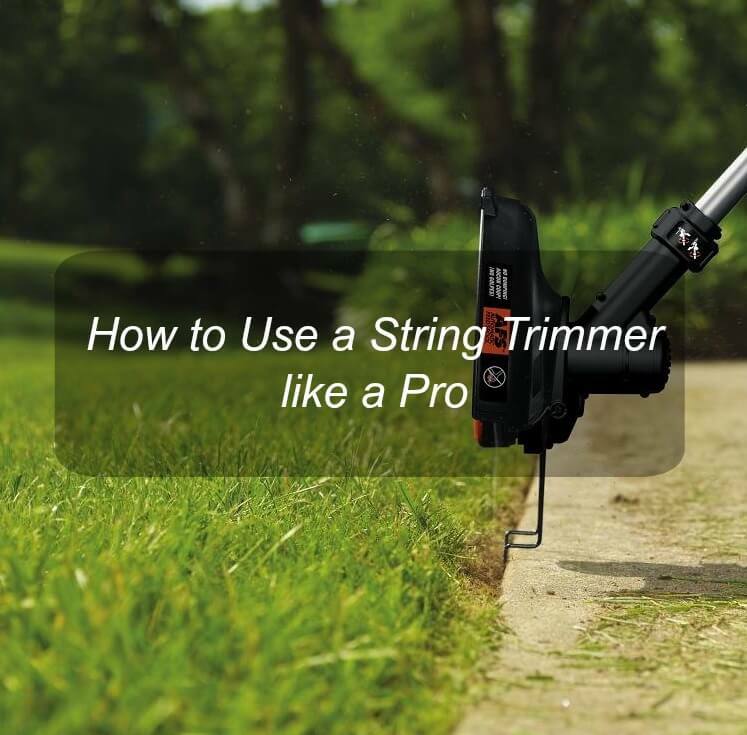 So, how do you use a string trimmer like a pro? Are there safety precautions to take? This post will provide you with some insights on how to get the job done. A vital step in using a weed eater is to be familiar with your tool. Take your time and research on the common features of your trimmer, where to find them, and their functions. The reason for this is the different types of weed trimmers currently available. All these tools use the same mechanism but operate differently. The parts or elements to take note of are engine/motor, shaft, line and a line cutter, start switch, handle, harness, guard, and spool. The trimming line of weed eaters can spin at speeds of up to 3000 revolutions per minute. Imagine what would happen if the line snaps? You need to protect your eyes, hands, feet and the rest of your body by wearing protective gear. Protect your eyes and your face using the right helmet. Use sturdy trousers and a pair of tough gloves. If you have a noisy trimmer, you will need an earplug. Electric trimmers feature cables for power supply. While these trimmers are not as powerful as their gas-powered counterparts are, they have enough cutting power to damage cable insulations. With time, the effect can reduce the efficacy of the cables leading to short circuit. Be careful about tripping and slipping hazards. When using your trimmer, you need to be mindful of your surroundings. Flying debris such as stone and pebbles may hit and injure bystanders or pets that lurk around. Buildings with glass windows and doors of buildings and cars are at risk and so you need to avoid working close to them. The most powerful string trimmers are those powered by gas. However, these tools use highly flammable fuel and produce exhaust emissions. You need to be extremely cautious because of carbon monoxide. This dangerous mission is invisible and very poisonous. Therefore, you must not use gas powered string trimmers in enclosed rooms with poor ventilation. Once you know your weed eater and understand the important safety precautions to take, it is time go out and apply what you have learned. First, you need to prepare to use your trimmer. You do this by reading your instructions very carefully, preparing your garden by removing hazardous debris and stones, wearing your protective gear and starting the trimmer. Have you ever seen a circular saw work? I guess you have. Sawdust ejects from one direction. A trimmer ejects or displaces grass and debris from the line and spool. The direction of displacement depends on the spinning direction of the spool. If the spool rotates clockwise, then the debris will eject on the right side and vice versa. This knowledge is important because you need to eject debris from where you are cutting. A string trimmer is designed to use high-speed centrifugal force to perform the cutting process. The faster the spinning speed, the stiffer the line and this leads to greater the cutting potential of the trimmer. 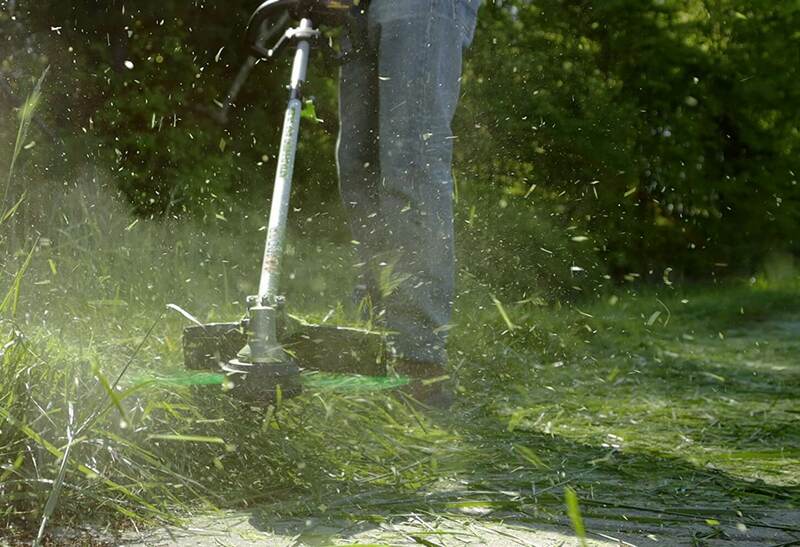 Many people believe that they can do the cutting just by hovering your trimmer over grass. This is not accurate. The cutting power is focused at the very ends of the trimming line. You must know the sharp point of a cutting tool to use such tool properly. Tapering: Tapering is somewhat similar to edging in some ways but not identical. The technique will help you treat edge along walls, fence line, tree, and curb. Tapering requires that you hold your trimmer in such a way that its string strikes the grass at slight angles. Scything: The word scythe simply means an obstruction. Scything is the technique you use on longer grass and weeds. It is only possible if you are a powerful trimmer such as the gas-powered models. The technique allows you to cut around awkwardly placed obstacles. To achieve this, you must take a long stance and bring the trimmer in and out of the cutting area in a shallow “U” shape. Screening: Screening is considered fast and effective for cutting grass and weeds that thrive on sidewalk cracks, sideways and paths. Tip the trimmer such that its strings just off the pavement and then move it onto the best of the weed and cut. Take care when screening. If you angle the trimmer too shallowly, it will not cut but eat into the string. On the other hand, if you angle the weed eater too sharply then the string will not be able effectively hit the weed base. I like the post very much. Thanks for sharing!